Sometimes I just can’t bear to turn on the oven. During the warmer months this is out of a desire to keep our humble little home cool. The kitchen, where I tend to spend most of my time believe it or not, is filled with lovely windows that give me a full view of our back yard from every direction. I also get a lovely view of the green belt behind our house that is filled with some beautiful trees. I do not have any drapes or blinds on these windows as I love the view. This is lovely in any other season but summer. Summer turns my window box kitchen into a sweltering sauna where only the setting of the sun offers any real relief if the oven or stove are used. Sweating while I cook is one thing I absolutely can’t stand. So, when it is hot I tend to make dinners and desserts that require little to no cooking to keep the kitchen, and me, cool. I am not usually a fan of no-bake cheesecakes. I find them a little dense in general, so when I decided to tackle a no-bake cheesecake I knew from the start I wanted it to be more like a mousse. This is not to say that it is some foamy cream cheese concoction. 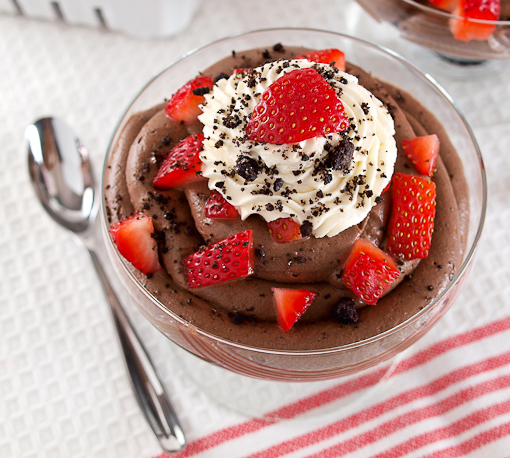 This mousse is luscious, creamy, and not at all heavy. 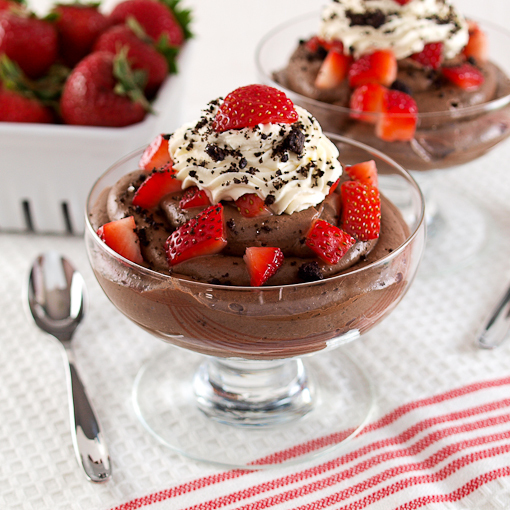 The cookie crust is very crumbly, and I like the texture it adds against the silky texture of the mousse. Combine that with the freshness of ripe strawberries and you have an elegant dessert that looks like it took a heck of a lot more effort than it really required. I used a little espresso in the whipped cream rather than the coffee liqueur called for since I was making this for friends with kids. The espresso adds some extra flavor and gives the whipped cream a pretty buff color. If you prefer you can also make this into an 8×8-inch dish rather than individual dishes. 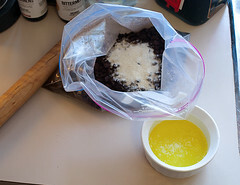 In a large zip top bag, or in a medium bowl, combine the cookie crumbs, sugar, and melted butter. Mix until the crumbs are well coated. Reserve 2 tablespoons of crumbs for garnish. Divide the remaining crumbs evenly between 6 serving dishes and gently press to form a solid layer. Set aside. In a small bowl combine the gelatin and the coffee liqueur. Allow to bloom for 10 minutes, then heat in the microwave for 8-10 seconds, or until melted. Do not let the gelatin boil. Allow the mixture to cool for 5 minutes. 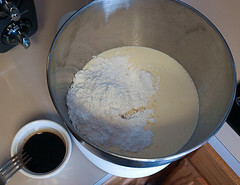 In the bowl of a stand mixer with the whip attachment, or in a large bowl with a hand mixer, combine the heavy cream, 1/2 cup of the powdered sugar, and vanilla. Beat the mixture on medium speed until it begins to thicken, about 1 minute, then slowly add the gelatin mixture. Increase the speed to medium-high and beat until the mixture forms soft peaks, about 30-45 seconds. Reserve 1/3 of the whipped cream in a separate bowl for garnishing the desserts. Set the rest aside. 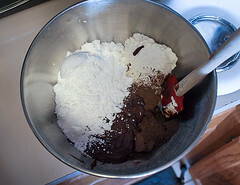 In the bowl of a stand mixer with the paddle attachment, or in a large bowl with a hand mixer, combine the cream cheese, the remaining powdered sugar, melted chocolate, and cocoa powder. Beat on low speed until just combined, then increase the speed to medium and beat until lighter in color, about 1 minute. 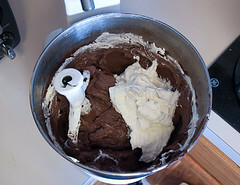 Add half of the whipped cream to the mixture and fold with a spatula until just combined. Add the remaining whipped cream and fold until no streaks of white remain. 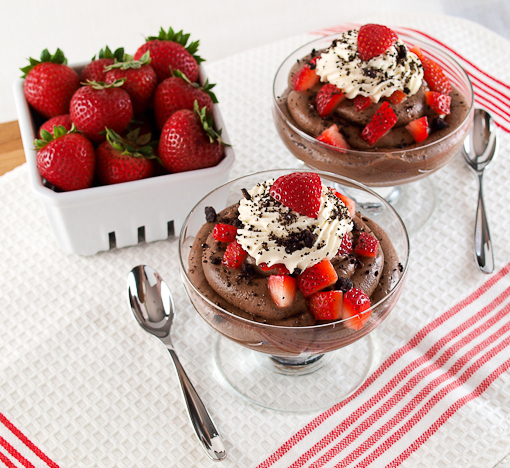 Divide the chocolate mixture evenly into the prepared dessert cups. It is easiest to do this with a piping bag. 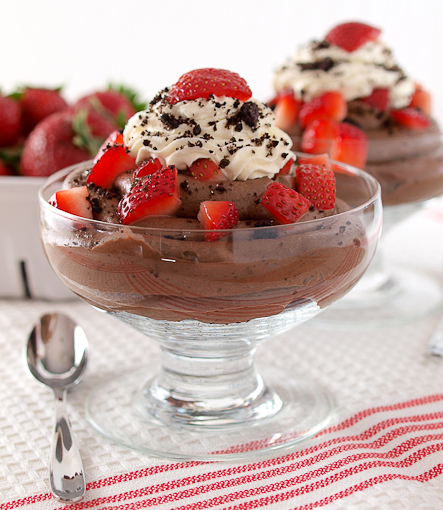 Sprinkle diced berries over the mousse, then top with the reserved whipped cream. Again, a piping bag makes this job easier. Garnish the tops of the mousse with the reserved cookie crumbs. © 2012, Evil Shenanigans. All rights reserved.